Need an enterprise information portal without a large commitment of valuable resources? Compared to other portal applications, KommerceServer webPortal is a fast, cost-effective way to enter the world of eCommerce. In many cases, you can have an effective, valuable website ready for your customers to use in only one week. New! KommerceServer Release 5.6 is available, contact Kore to setup a product demonstration. Give your customers the convenience of 24/7 self-service capability so they can quickly and easily track in-transit shipments, view their current orders, re-order using shopping lists, see their open Acccount Receivable balance, and more. With webPortal and a few mouse clicks, your customers can view their current and historic orders or credits. And our portal application automatically links to Federal Express. UPS, DHL, or other carrier to track in-transit shipments. A customer portal will give your customers 24/7 self-service access to view their orders, invoices, shipments and more. With webPortal, your Customers can search and view historic or currently active business transactions. A list of historic purchases summarized by product provides your customers a way to examine the frequency and volume of the products they buy. This can help them determine appropriate order levels and policies with your company. When integrated with webStoreFront the webPortal shopping lists can be used as an order form for your customer's convenience. By simply filling out the quantity for each product desired and submitting the page, the products are added to their shopping cart. Once an order is placed, customers can use the webPortal to view shipment details and link to the shipment carrier's website to track individual shipments. Historical transaction pages link to the related product detail pages in the webStoreFront where your customers can re-order a product conveniently or repeat and entrire order with a single click. Multiple customer accounts can share a master reference, thus grouping them into one virtual customer. This is ideal for large customers with many store locations. A buyer in one store can be granted the permission to follow up on an order and delivery status for any store within the virtual customer. Our enterprise information portal also give you complete control. You to not only control which people (contacts) have access to your website -- you also control which of those contacts are administrators. Contact administrators have the authority to create or remove contacts within their own company. This feature can save your staff valuable time managing contacts, especially for your large customers where there may be many buyers or employee turnover in the company. KommerceServer webPortal is Mobile ready out-of-the-box. Get the power of webPortal in a compact mobile package using a streamlined, responsive user interface designed for the requirements and workflow of the mobile user. A perfect complement to your corporate website. 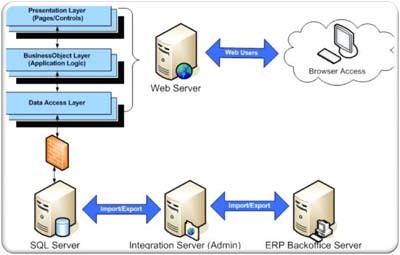 KommerceServer webPortal is designed for integration with a back office system. This integration provides key information for the webPortal such as: customers, orders, credits, shipments, invoices, etc. KommerceServer uses Kore's Kourier Integrator product to enable integration with other back office systems. A key feature of Kourier Integrator is the ability to update the KommerceServer SQL Server database in near real-time with only the most recent changes from the back office system. This makes it fast and easy to keep the systems synchronized and boosts overall performance. KommerceServer has pre-defined integrations to several ERP systems such as: Epicor Eclipse, Epicor Prelude, Epicor DataFlo and Infor LN (Baan). The fact that KommerceServer uses Microsoft SQL Server as its transaction database, plus the overall architecture and integration design of KommerceServer provides many advantages and benefits compared to an eCommerce system that is directly connected to your MulitiValue back office system. The KommerceServer solutions are designed to expedite your eCommerce implementation and minimize costs. The solution pricing includes all the software and services needed for a complete eCommerce Solution. 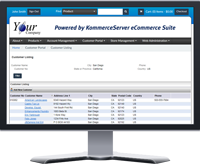 KommerceServer solutions can be deployed to a service provider or it can be hosted locally. In either case, your systems must meet certain minimum requirements, contact Kore for details. eCommerce webPortal solutions that extend your enterprise over the Internet, allowing you to connect with customers, collaborate with partners, and compete more effectively in the global market! KommerceServer webPortal: the enterprise information and customer portal that is a cut above the rest, providing companies with a fast, cost-effective way to enter the world of eCommerce. Call Kore Technologies for more information and to schedule a detailed product demonstration.